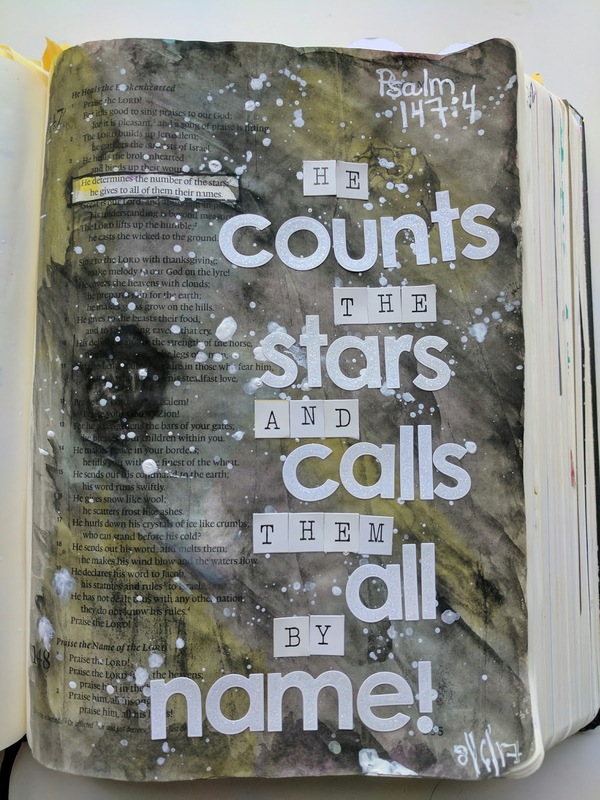 I was inspired to do this page after watching a video on galaxy watercolor by Kristina Werner. I use the Prima Watercolors in almost all, but this page used just The Classics set (if I recall correctly) I start all of my pages with a thin layer of gesso and after it's dry I randomly painted blue, yellow, and pink across the page and then heat set it so I knew it was ready for the black galaxy covering. I knew I wanted to have a "wormhole" so I drew that on the left part of the page as I continued to get this space look. 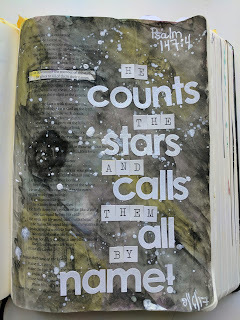 After I dried that and put down extra layers of black as needed I used a paintbrush and watered down white paint to flick across the page to create the white stars. I used some old white alphabet stickers from my stash. The blocks were from one of the first Dear Lizzy collections and the larger are My Little Shoebox. I used my white signo pen to write down the exact verse this page was about and dated it. And it was a fun page that didn't take too much time to do.